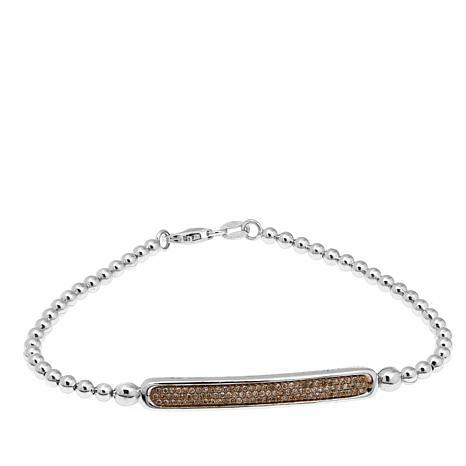 Raise the bar on what you expect from fine jewelry with this pretty diamond bar bracelet. 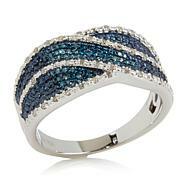 Your choice of champagne, blue or black diamonds, pavé-set in polished sterling silver, lend a luxe look to any outfit. 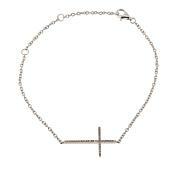 I do agree with the review stating that the bracelet is difficult to put on. 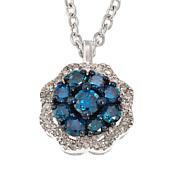 However it is a great look for the price and the blue diamonds look quality. The beaded area has stretch which is a nice feature. Also the diamond bar area seems to stay in place. Got the blue. Stones so small they look like nailheads. Theres some sparkle but onlu in good light. Also blue is so dark it looks black. Id spend the money on more bang for my buck on bali. Sent it back. I thought the diamonds were twinkly but so small. They looked more like blue pixie dust. Kind of disappointed. I might keep it as a present for someone. The diamonds sparkle, but it is impossible to get the bracelet on. There is not enough flexibility. Wish manufacturers would do fit tests to ensure product works.